When I moved to Dubai three years ago, the Lime Tree Café quickly became a favourite haunt for it’s salads and treats, with their Carrot Cake and Triple Chocolate Brownie causing far too many sugar highs for my own good. I stayed loyal to the Lime Tree Café for my carrot cake fix for about a year, within this time I noticed the gradual reduction in portion size, and shortly thereafter I broke from the reliable goodness of the Lime Tree Café. 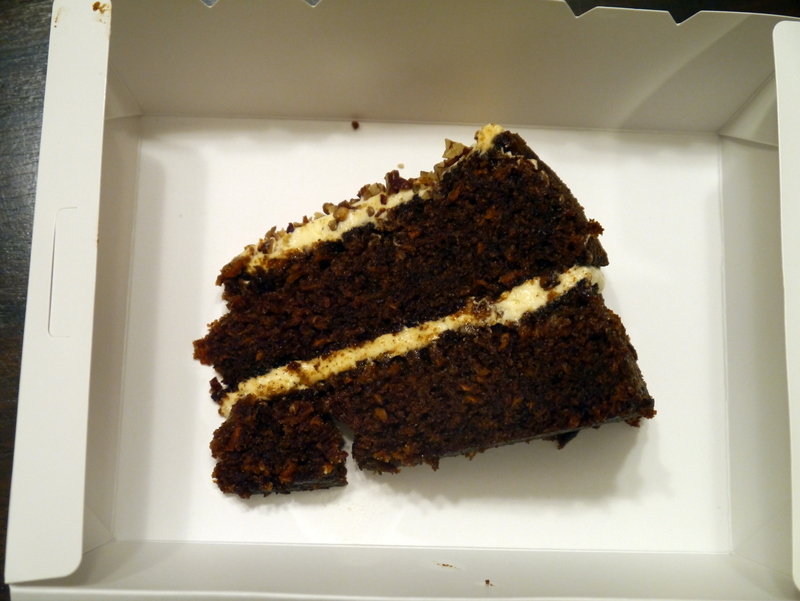 I was pleasantly surprised by Jones The Grocer’s take on the traditional carrot cake, however it was Baker & Spice’s offering that really floated my boat and became my new favourite treat. Having found something that I thought knocked the socks off the Lime Tree’s chunky orange former fave, I wondered if I could pick out my new fave from a line up…or was it just my bias for Baker & Spice that skewed my taste buds? 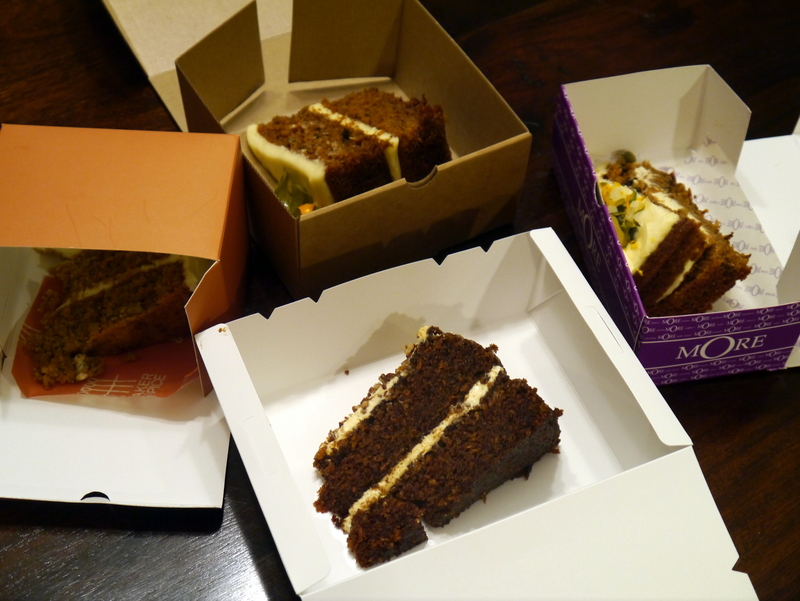 I formulated a plan (otherwise known as a fiendish excuse to gorge on cake) to ‘research’ the carrot cakes of Dubai. With a background in clinical research, the only way to conduct my ‘research’ would be a randomized controlled trial, my hypothesis being: ‘the Lime Tree Café’s Carrot Cake was the best carrot cake from a selection of cafés in Dubai.’ [*scientists please feel free to roll your eyes*]. I picked four well known cafés: Jones The Grocer, Baker & Spice, More Café and of course, the Lime Tree Café to select my samples from. Sample collection involved driving pretty much all over Dubai to collect slices of cake for the experiment. The controls for the experiment included me being blindfolded for the taste test and the cakes being fed to me by my husband, with a mouth rinse between cakes. The cake samples were served at room temperature to ensure full flavor for the taste test. Cakes were judged on their appeal to all the senses; smell, size, colour, taste, texture / consistency, and fruit & nut content. 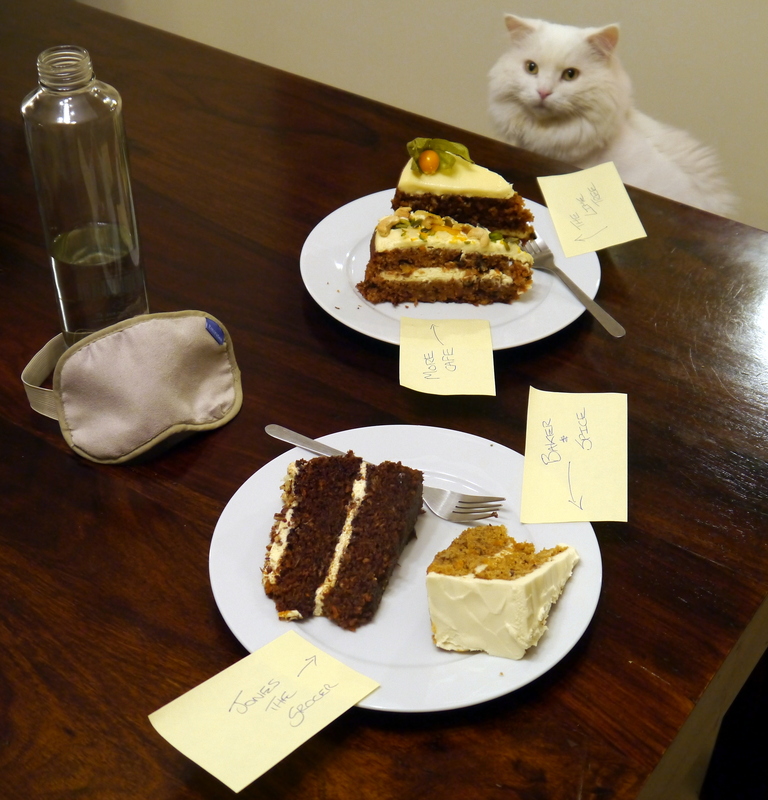 An independent adjudicator, Puddy the Turkish Angora, was on hand to ensure that the strict standards and controls were adhered to…and if a crumble of cake fell on the floor, he would be responsible for hygiene in this area. An attractive looking chunk of cake, simply finished with a Chinese Lantern or physalis. The thick layer of icing was soft and creamy, not overly sugary, and it looked a little shiny-synthetic. The texture of the cake was quite dense yet crumbly at the same time, however, I felt it was slightly undercooked towards the centre of the slice. There was a very mild hint of spice, like someone had slipped in just a pinch of cinnamon, however, this wasn’t enough to add to any real flavor. On the whole the Lime Tree Café’s carrot cake is a good option, easy to see why people say it’s all about that thick creamy icing. More Café’s carrot cake was a good-looking cake decorated with a generous scattering of chopped nuts and fruit over the top of the icing. The cake exhibited a spiced flavor, the inclusion of nuts in the mix was a bonus, however, this wasn’t enough to counteract the soggy, undercooked texture of the cake. And the icing, urgh! Slimy and synthetic. Overall, not very impressed, it’s definitely one I wouldn’t waste the calories on. Jones the Grocers’ carrot cake was a good-sized chunk of cake that looked dark and mysterious and smelt fabulously spicy. The icing was non-descript. Upon tasting, I found the rich treacle-like taste totally overpowering to the point of being super sweet. The sweetness overpowered any spiced flavor you could smell. The consistency was light and fluffy, but it bordered on being just a little bit too light and airy…there is just no pleasing me! Altogether, I’d wouldn’t go back for this, it was far too sweet for me. 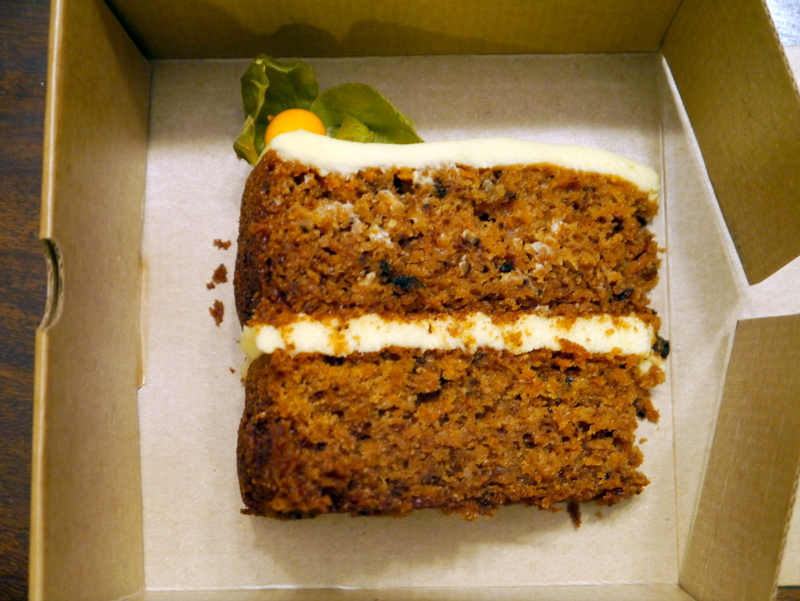 Slice size-wise, Baker & Spice’s carrot cake was one of the smallest in the experiment. The icing was a lovely balance of creaminess and sweetness with a citrus tang to it, exactly what I imagine my perfect cream cheese icing to taste like. Cake-wise, it was well cooked and there was a good balance of denseness and lightness to the texture, plus it had nuts and a bold spiced-flavor with pleasant aftertaste. 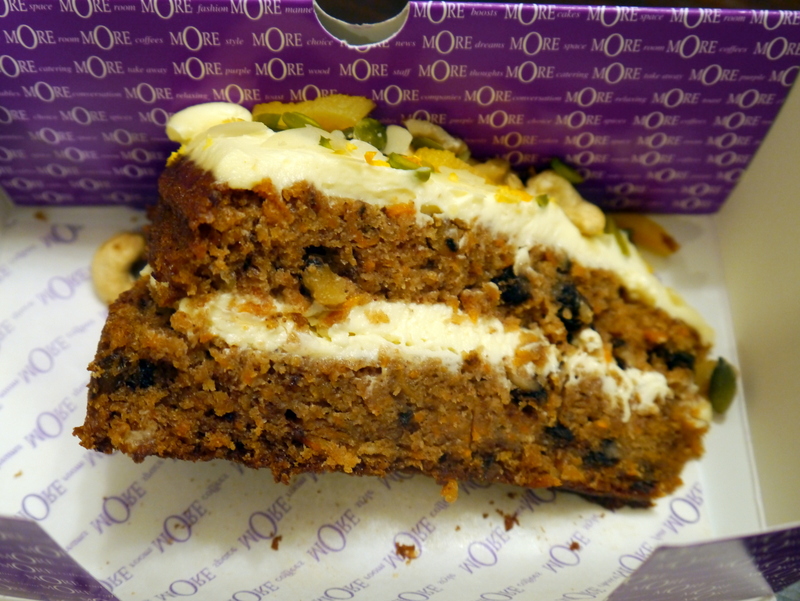 Baker & Spice rocked my boat again, this was my favourite carrot cake from the selection. Best for: The ethical organicist with great taste! And so, the overall winner was Baker & Spice. I’ve already admitted that Baker & Spice is my favourite place to eat in Dubai, and that I prefer their cake over the Lime Tree café’s. I genuinely tried to go into this little experiment with an open mind, trying not to introduce bias, I had actually assumed that the Lime Tree’s effort would come out on top, and to my surprise, it didn’t, the cake itself just didn’t have any punch to pack in the taste steaks. 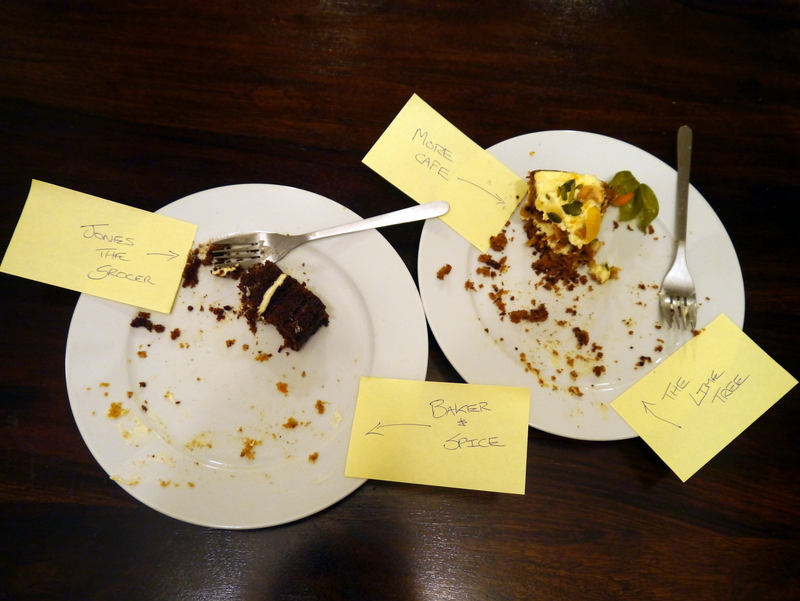 If we’d been judging on icing alone, this *could* have been a different story…although Baker & Spice’s icing rocks! I’m going to go on to say that I think Baker & Spice deserves to come out on top, not only due to the taste factor, but because Baker & Spice go one step further than any other eatery in Dubai to ensure that their ingredients are of the highest quality and ethically sourced; local, organic and fairly traded, and that their dishes have an authentic home-made quality to them. 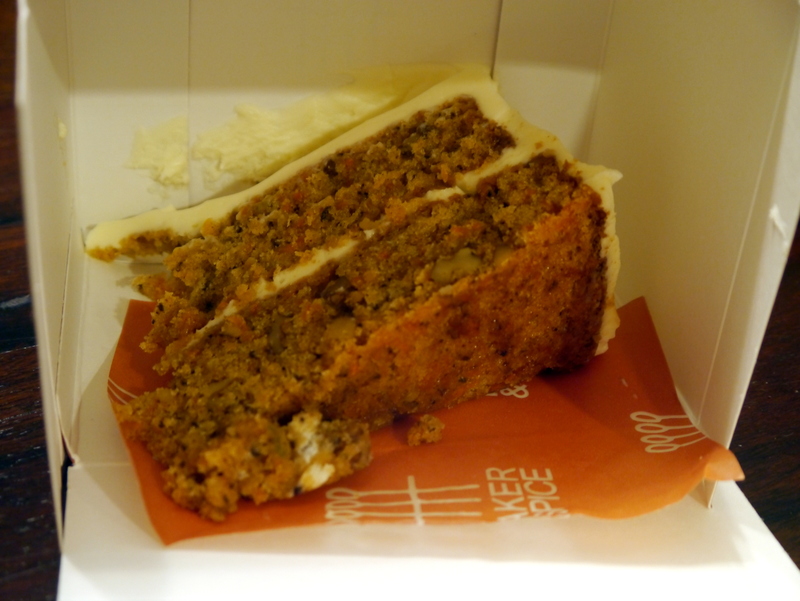 Summing up: Baker & Spice’s carrot cake is a carrot cake with a saintly halo! Obviously there are some things you can’t control for: taste is subjective, and then various factors effect taste, including storage & freshness, and each cake will be slightly different because the ingredients will vary in flavor and quality from one batch to the next, and even from one cake to the next.